If you’ve read the posts I’ve written on my personal blog documenting the cool retro stuff my Mom gave me, you knows that I’m a sentimental type. So of course I thought it was cool to see so many readers proudly displaying wall art that was made by or given to them by beloved family members. 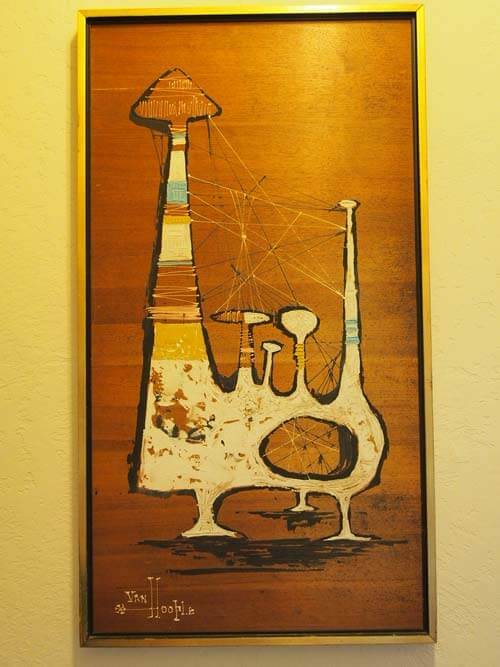 Above: An original painting by a reader’s grandfather, circa 1960. 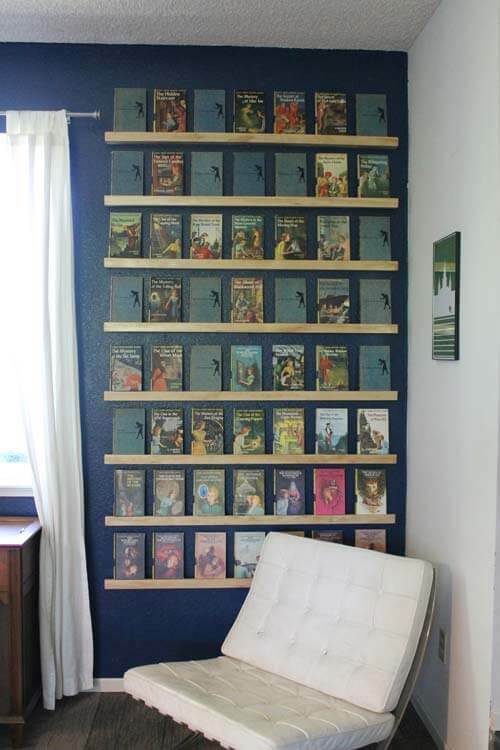 Above: Reader Amy F. displays the vintage Nancy Drew books that she inherited from her grandma on shelves lovingly made by her husband. How’s that for sentimental wall art? I’m a huge fan of retro collections — especially when they are nicely displayed. There’s just something about a grouping of like objects all lined up in tidy, pretty rows or arrangements that is exciting and fun to look at. 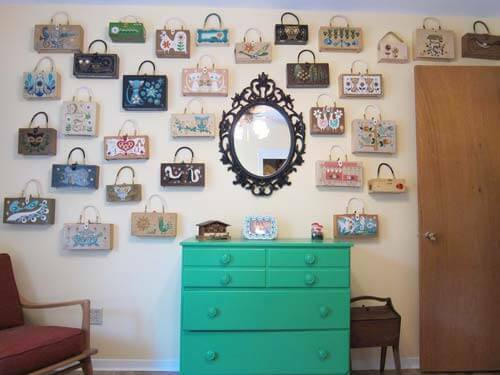 Above: This collection of vintage Enid Collins purses from Betty Crafter is not only impressive, but look how fun these purses are when used as wall art! 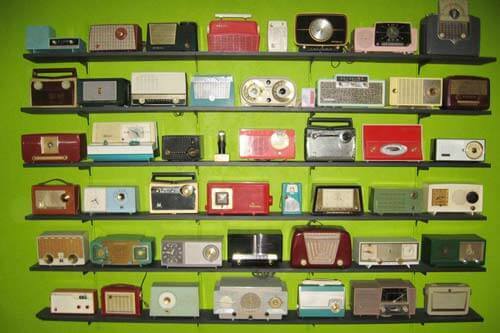 Above: I’m loving this impressive collection of vintage radios from crash pad designs. Above: Uncle Atom knows how to display a collection! Look at his awesome shelf full of retro lunch boxes alongside the coordinating lunchbox print. Nice. Above: Reader Rhonda has been collecting vintage advertising keychains from the 50s and 60s — and many other types of keychains — since she was 13 — impressive! 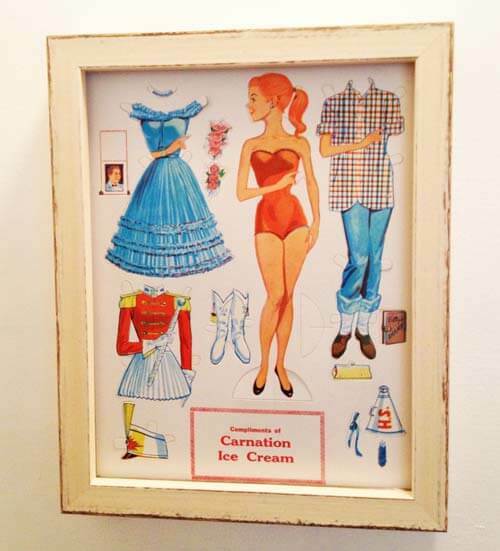 She’s been displaying some on the wall and keeps the remainder of her collection in a vintage dental cabinet. 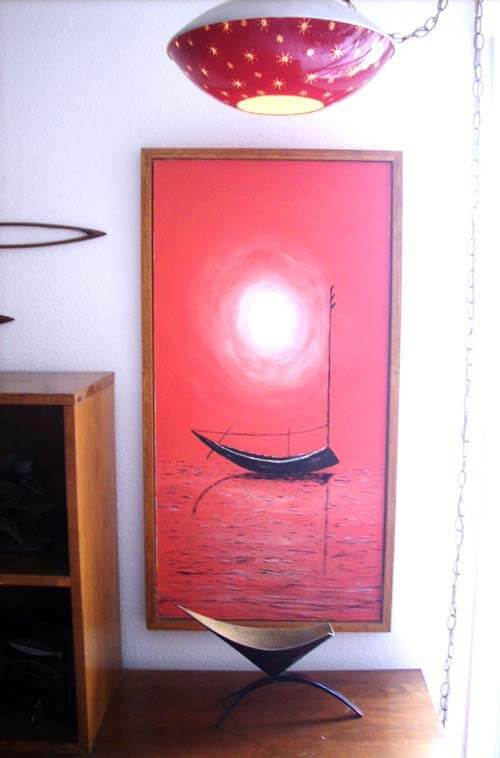 If your style is anything from mid century modern to vintage kitsch, a wide range of vintage wall art can be found in thrift stores and estate sales. 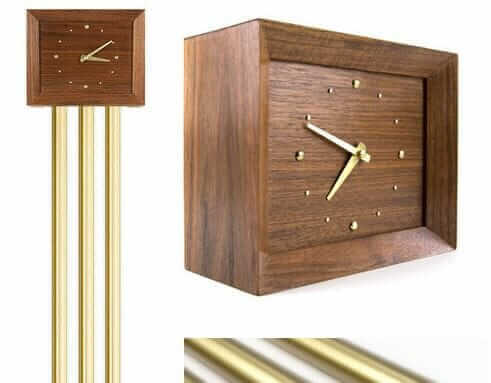 A great piece of art or a grouping of smaller pieces can be just what is needed to elevate the decor in your space. 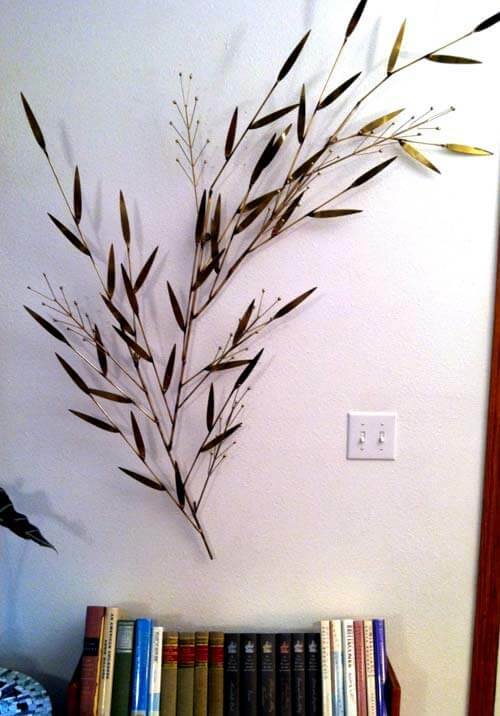 Above: Becky from Iowa’s vintage C. Jere brass wheat sculpture ads a mid century cool vibe to her living room. 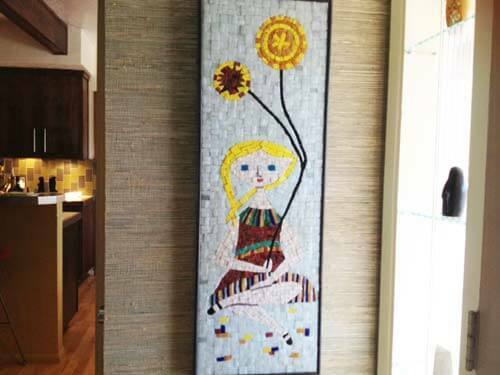 Above: This reader’s mod mosaic was purchase with S&H Greenstamps in 1962. Above: Vegebrarian’s kitschy collection of vegetable figures is sure to bring a smile to your face — whether you’re a fan of brussel sprouts or not. 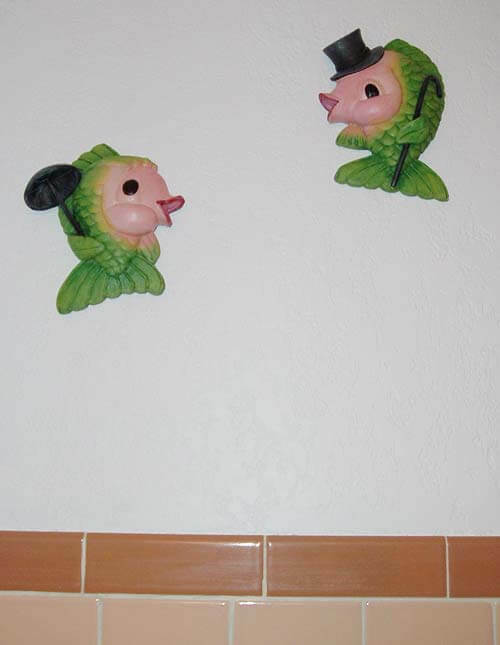 Above: midcenturythriftygal’s Miller fish are kitschy and cute — and they help ad a sense of humor to the bathroom. Above: Since we’re on the subject of humor, this reader’s racy vintage movie poster made me laugh out loud. 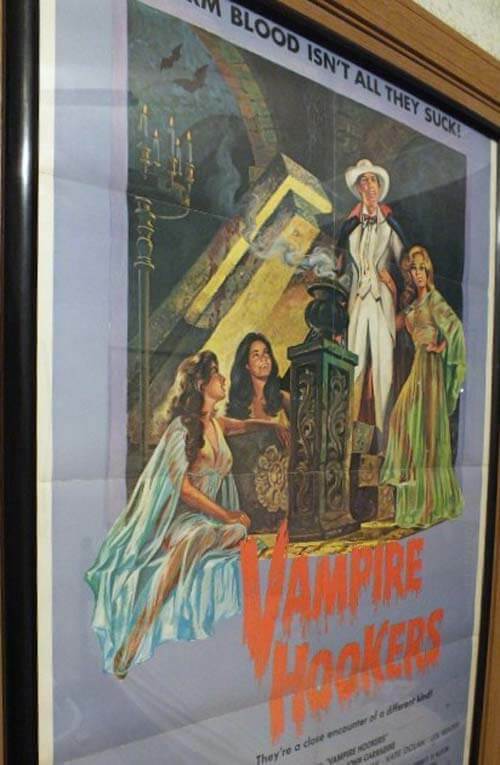 Not just another classic horror movie poster, this one leaves a lot to the imagination. Sometimes the most unexpected art pieces are the objects that weren’t initially meant to hang on a wall. 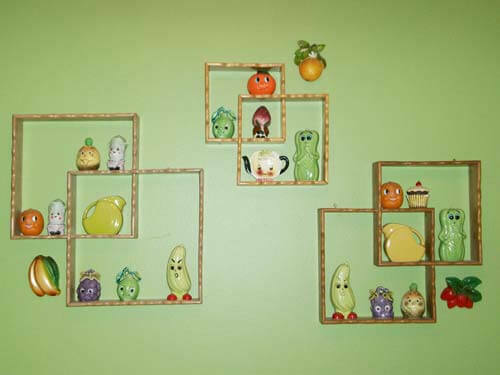 Making wall art out of things that were never intended to be displayed as decoration can help make your room memorable. 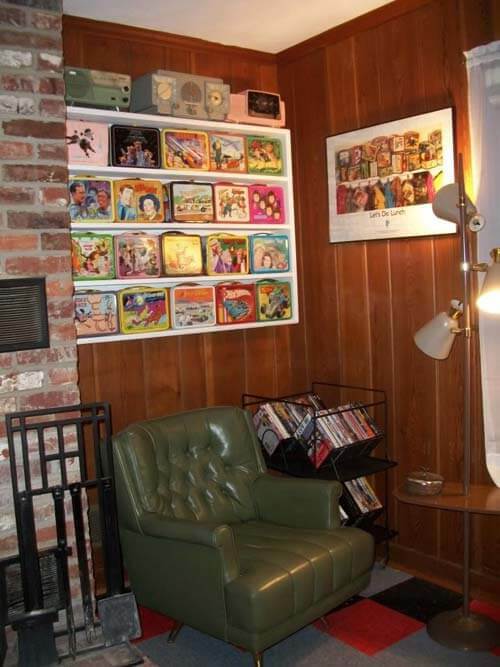 Above: Reader Michael scored an amazing vintage Kroehler Furniture Do-It-Yourself Decorating Aid Kit at an auction. They rotate to change the style and color of the furniture in the room, how’s that for interactive? 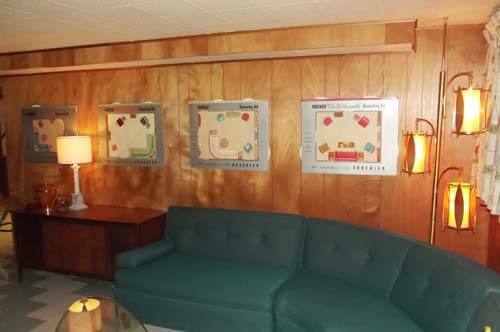 The best part is that Michael decided to display them in his rec room as wall art — which is imaginative and unexpected. Above: This vintage paper doll set was never used — providing the perfect unusual piece of wall art for this creative reader. Everyday kitchen objects, such as pans, plates, trays, salt and pepper shakers can be used as accessible art in the kitchen. Making decorative displays for your kitchen collectibles can do double duty — storage and decoration. 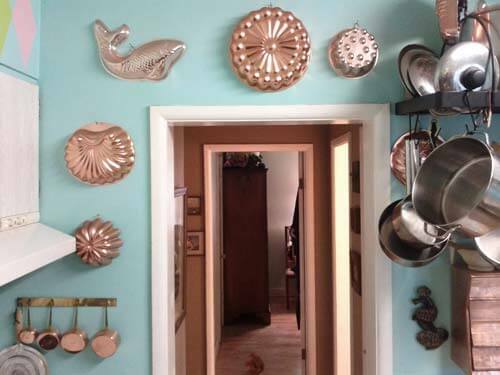 Above: Scott’s collection of copper cookware makes for a sparkly bit of wall art. I’ve thought about hanging some copper jello molds on the soffits in my kitchen, this lovely arrangement is making me want to start collecting them for my house. 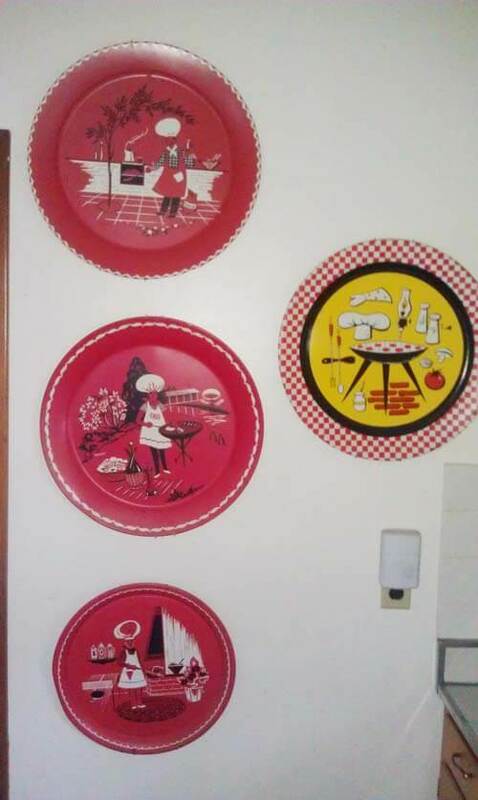 Above: This reader’s grouping of retro metal BBQ trays is fun and colorful — a good way to add some mid century graphics to an otherwise blank kitchen wall. 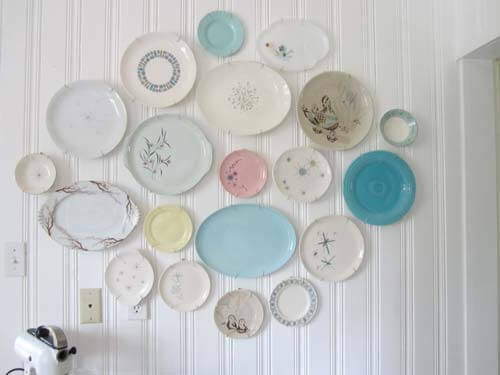 Above: This reader’s collection of thrift store plates is artfully arranged on her kitchen wall. 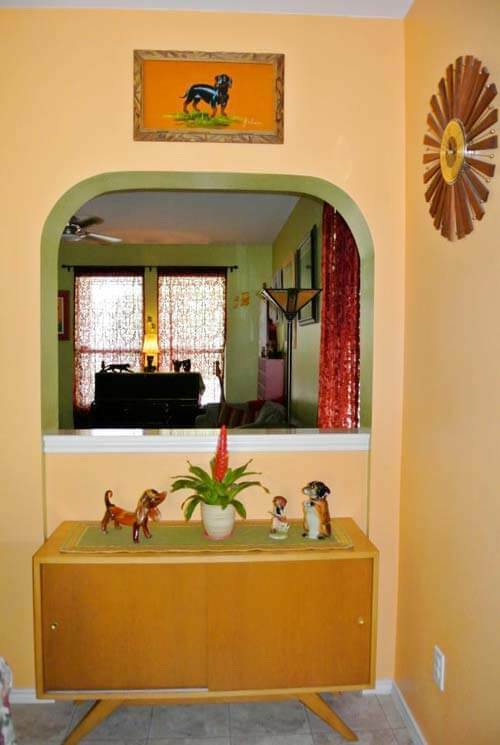 The variation in color, size and shape work well with the texture of her painted white knotty pine walls (which she assures us were painted by the previous owner). Diverse collections or tastes can be made to feel unified by repeating elements — color, shapes or content — to help mix styles and create a unified look. Above: Elena S. has mixed modern with retro nicely — using these modern looking shelves and filling them with retro artifacts that all share a similar color scheme. Above: Reader Yasmin shows her love of dogs and her love of retro — by repeating elements from both collections on the walls and throughout the dining room. 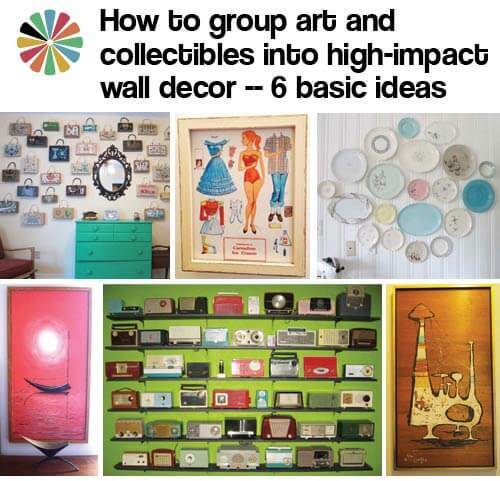 No matter what type of wall art or collection you choose to display in your space, adding vintage pieces can really up the wow factor — injecting that bit of uniqueness that just isn’t found in today’s off-the-shelf art and decoration. nice collections, nicely displayed. I have kitschy fish in my bathroom as well – complete with the bubbles. Something I didn’t see is beer signs – I inherited several of my Dad’s vintage beer signs. Just enough to be classy (not like a modern sports bar themed basement). I LOVE vintage beer signs! 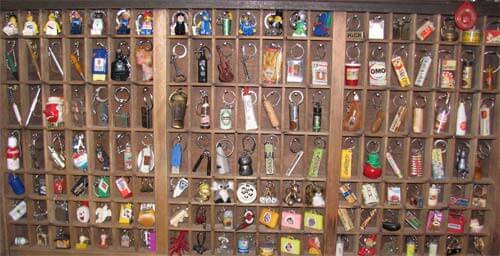 Hey, my keychain collection made it! FUN! 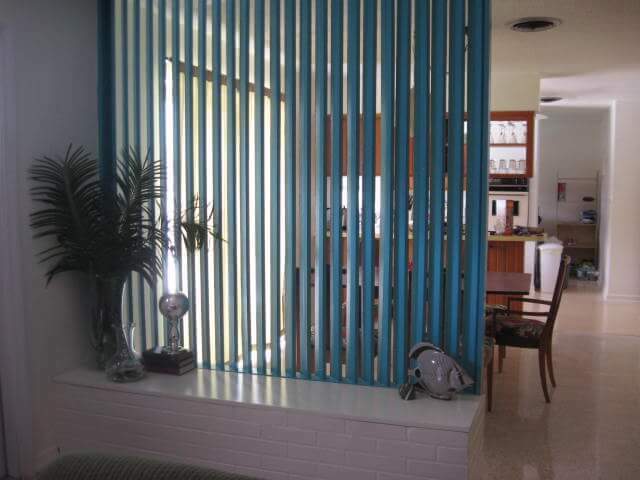 When I was a kid, those copper molds hanging in a kitchen in big groupings were A Thing. Most were pretty flimsy, and I never saw one used. Plenty of them were made for the decorative market alone. It was very chi chi then, and still looks great! Love them on that wall color. 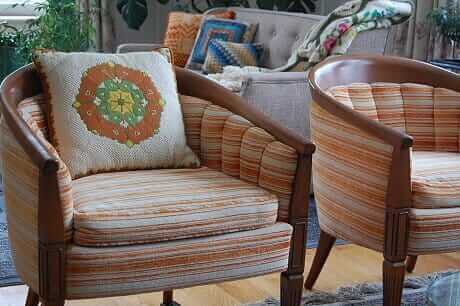 I used to work for a vintage dealer in New Orleans; It’s nice to see what the stuff looks like in someone’s space. 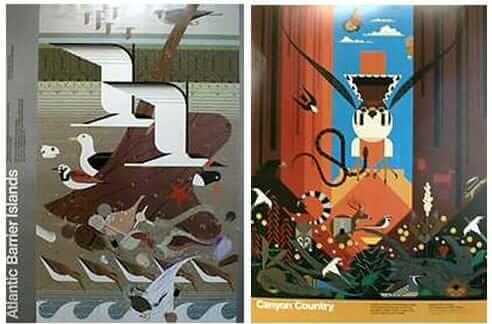 Everything that came in was infinate possibility, but we rarely saw it in the wild once it was adopted and taken away.